to the bustling old town of Chiang Mai. Located in one of the most popular areas in Chiang Mai, ideally situated in a scenic area with view of the Wat Doi Suthep. Just a stroll away from the upscale Nimman road with lots of local shops, shopping centers, cafes, restaurants and close to the bustling center of this culturally rich city of the old town Chiang Mai. 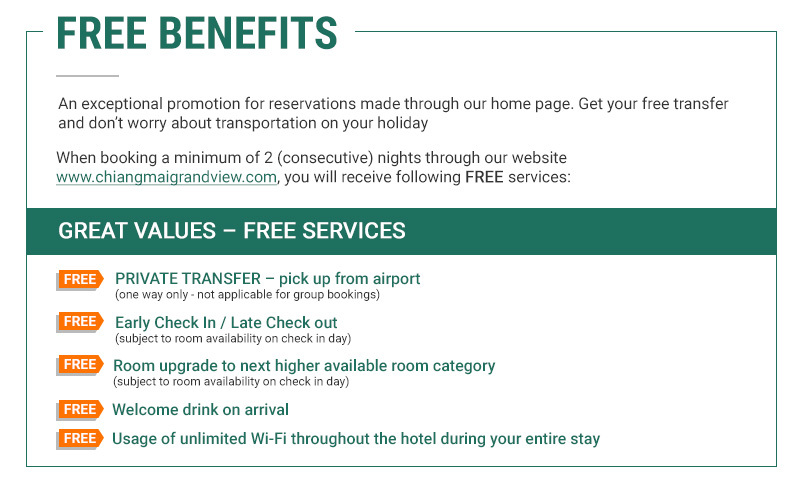 The International airport is only 10 minutes away and our hotel offers private transfer for our guest convenience. 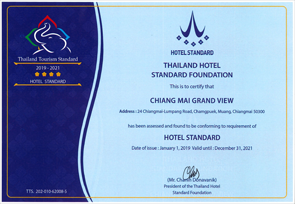 The Chiangmai Grandview Hotel offers 200 elegantly appointed and tastefully furnished accommodations. Further we provide a strong International multilingual management and a service-oriented team. You will feel right at home, belonging to this magical paradise Chiang Mai. Our philosophy is to stay true to the local culture and maintain nature’s beauty, so that our guests get the best experience of Chiang Mai. Our Convention Center is the largest & with most modern facilities of its kind in Chiang Mai. Located only 10 minutes away from the Chiang Mai International airport. With a seating capacity of up to 2,100 people, it makes it the perfect venue for leisure, corporate and MICE travelers. We are able to host any kind of function to suit your requirements. Whether you are looking to hold just a meeting or a Wedding, we can arrange different wedding types and themes to make it your happiest day of your life. All of our Superior rooms are 26-28 square meters in size, and contain either a double or 2 Twin beds. Each room contains a private bathroom and either a city or mountain view. 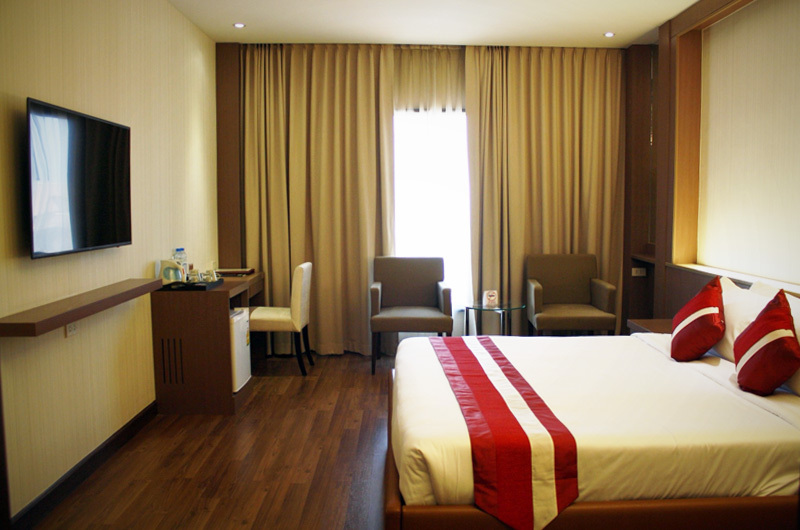 All of our Deluxe rooms are 26-28 square meters in size, and contain 2 Twin beds. Each room contains a private bathroom and either a city or mountain view. All of our Premium rooms are 36 square meters in size, and contain either a King sized bed or 2 Twin beds. Each room contains a private bathroom and either a city or mountain view. The Grand Premium Suite is 78 square meters in size, and contains a King sized or Twin beds. This luxurious room contains a private bathroom with bath jacuzzi and shower. Guests can enjoy plenty of seating areas within this spacious room, all with a scenic view of the mountains, and there is also a living room, kitchenette and pantry. The Grand Royal Suite is our most luxurious suite available, and is 78 square meters in size. This luxurious suite room contains a private bathroom with bath jacuzzi and shower. Guests can enjoy the outstanding design which features a kitchenette and a pantry for guests to use. 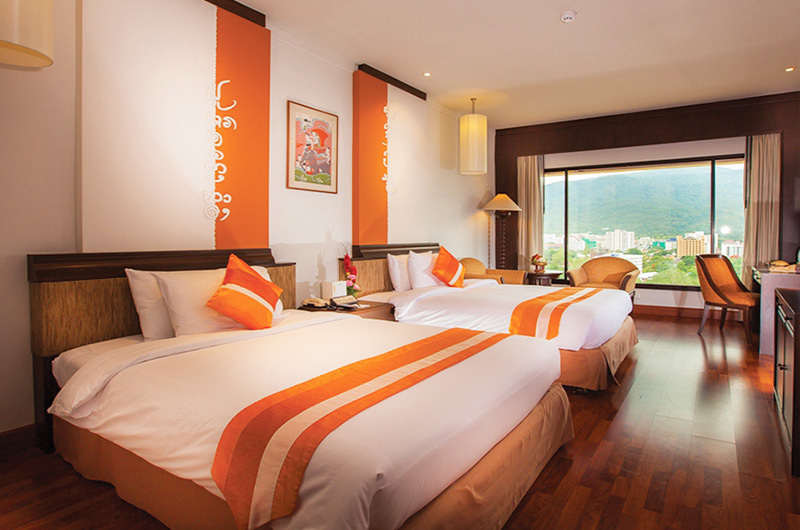 A stunning view of the Doi Suthep mountains can be enjoyed within this suite. We are conveniently located within walking distance of Chiang Mai’s most desired nightlife with restaurants, bars and boutiques in the trendy Nimmanhaemin area as well as a short stroll to Maya shopping center.